2015 has been a year in movies marked, as my colleague Leigh pointed out, by very simple, very well told stories. 45 Years has the simplest of all these stories. Kate and Geoff are celebrating their 45th anniversary on Saturday. On Monday, they receive an unexpected letter concerning something that happened before they even knew each other. Over the six days from the letter’s arrival to the party, their perceptions of each other and their marriage are irrevocably changed. 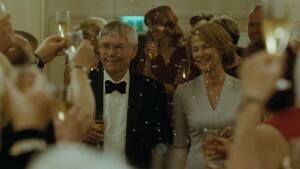 Kate and Geoff are played by two pop culture cult figures, Charlotte Rampling and Tom Courtenay. Both are, quite simply, perfect. Rampling has garnered the majority of media attention, as 45 Years is presented from Kate’s point of view, and she deserves all that attention. She is so beautiful and forceful, with her deep, penetrating eyes, straight-edged posture, and quiet command in her voice, that her vulnerable moments affect an audience all the more because we cannot believe she could be this shaken. She infuses every movement with significance, from driving a car to window-shopping: her attention and deliberateness translate Kate’s inner turmoil into something observed. And though Rampling has a captivating voice, her most memorable scenes have no dialogue: both the finale and a heartbreaking part in the middle in which she spends an afternoon home alone. 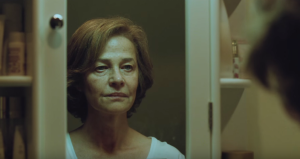 Her face and her gait say as much as any monologue, and left me convinced I could watch an entire silent movie starring Charlotte Rampling. If Kate is the more considering in her speech, Geoff is by far the more loquacious, and Courtenay turns banality and reminiscence into poetry. He resembles the grandfather we want to have: charmingly unshaven, winking behind his glasses, cheerfully potbellied, and speaking his mind like someone who knows their time is finite. (A small line near the beginning that means a lot is that the 45th anniversary party is a substitute for the 40th, cancelled when Geoff had a major health scare.) Courtenay gives Geoff a stiffer, cautious physicality complemented by a lyrical, easy way of speaking. He projects good humor even at whatever bête noir he fixates on at the moment—broken toilets, climate change, annoyance at ukuleles. However, he finds it harder to express emotion or say things that deep down he wants to say, or doesn’t want but needs to say. Thus when Courtenay gives way to anger or tears, it is as shattering as when Rampling breaks down. It need hardly be said that Rampling and Courtenay are great counterparts. Their differing general emotional states mix well and they physically synchronize in their scenes together—watching Kate and Geoff dance is watching something very lovely. 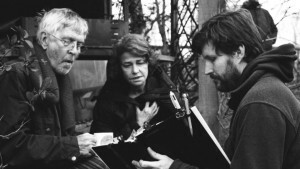 Rampling and Courtenay’s excellence works in conjunction with that of writer-director Haigh; it is easy to imagine how all three brought out the best in each other. Haigh’s screenplay is exemplary in its economy. The dialogue carries all the conversational rhythms of people who are comfortable with each other and leaves unsaid exactly what wouldn’t be said in real talk, while being artfully composed enough to allow the viewer to infer what is going on behind the words. 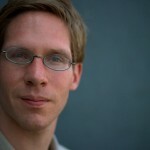 His directorial style is understated and well-planned. He uses only two locations, Kate and Geoff’s home in the country and the small city nearby, and films them with an understanding of how people enjoy familiar spaces and how those spaces change and become more welcoming or more foreboding in light and darkness. 45 Years looks like real life, but it also sounds like real life. The team led by Ivor Talbot and Joakim Sundstrom is a marvel. They complement Haigh’s pictorial skill with a sound design full of an undercurrent of rain, creaking wood and pipes, motors, pop and classical music coming from various devices, and other everyday sounds that create the same white noise background to our existence, and it happens without the forced quality of Dogme 95. This atmosphere and the strength of the acting and script combine to make 45 Years a film so real it almost becomes excruciating. For in 45 Years, Haigh documents how lifelong commitments are so wonderful yet also so fragile. It is a film about how not being completely honest can slowly eat away, how not wanting to talk about certain things or not wanting to listen certain things can provoke the greatest conflict, and how human beings must actively face an inherent self-centeredness to truly love each other. Kate and Geoff, and this becomes apparent the more one thinks about 45 Years, are, even so deep into matrimony, both thoughtless towards each other and selfish in different ways. These qualities give the story its drama, and they are so compellingly handled that I was dwelling on the thoughtlessness and selfishness with which I have treated others, and which I have seen in the relationships and marriages of friends and family, including my parents who have been wed for thirty-six years. This is a movie that should make anyone re-examine themselves, especially devoted couples. 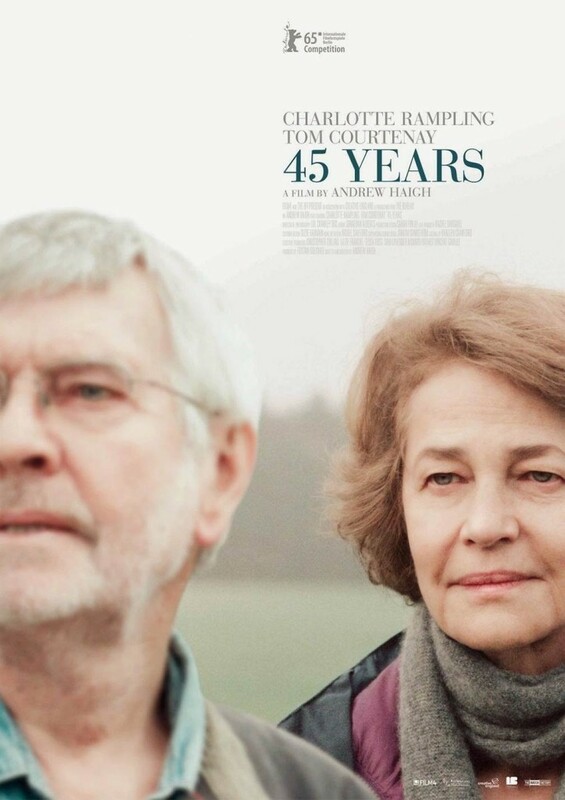 45 Years is so magnificently made in all the aforementioned aspects but got no love from Oscar apart from a nomination for Rampling, who almost instantly shot herself in the foot. The Academy’s ignorance of the movie’s overall strength is a shame because it is the sort of tiny picture that requires attention. I urge people to seek it out and I greatly look forward to what Haigh makes next. Pictures from The AV Club, Awards and Such Files, Trailer Addict, and the Wall Street Journal. 45 Years is currently playing at the Landmark and AMC Theatres.